I’m not surprised at the level of UK scepticism as the main impacts of climate change are decades away and in other places. The problem is poor science awareness. We need to improve science education so people properly understand climate science. So it’s the sceptics who need educating is it? There’s lots, lots more like that. At least they’re not uneducated idiots like those sceptics. Update 17.30. Let’s not overlook the fact that it’s probably all about oil too. 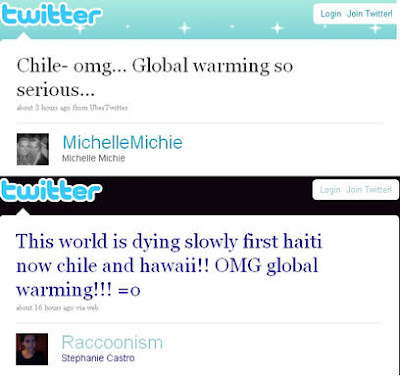 36 Responses to OMG Global Warming!!! Alas, once the current victims of primary, secondary, and University “education” hit the streets, this will be the norm. The ideology is thrust down their throats at every opportunity. They’re no longer taught “useful” subjects, but indocrinated into the AGW dogma all through their time in school – taught what to think, and not how to think – so that they emerge as nascent-lefties toeing the socialist line. The cause of tektonic activity, and just about anything else will be lost to them, and those comments portrayed above will be typical. Let’s dumb down the world. Then what? Just had a flick through that list of tweets. If you do the same, click through to the tweeter’s profile and have a look at all their recent tweets. Some are more rediculous than the ones mentioned above! Is this level of ignorance new, or is it that there is always a certain proportion of dumb people and the internet just makes us more aware of them? Perhaps Richard Black could have a word with the top brass at the BBC and ask them to run serious science programmes instead of some of the junk they currently mass manufacture. Given his views it’s odd that Mr Black works for the BBC at all. If I was that worried about the poor educational standards in the country I wouldn’t work for a corporation which is responsible pumping out thousands of hours of dumbed down entertainment to the population. I’m not surprised, the BBC themselves have used material from earthquakes in reports on climate change (the Tsunami of 2004 being often used) and when you think crap like fat boy Al Bores crappy movie is treated as ‘science’ in schools you know we’re all doomed. I’ve heard Hollywood thicko’s state that Haiti was caused by climate change on several occasions and no one has corrected them or humiliated them for their lack of knowledge. Imagine if I stated on TV that Bill Shakespeare wrote War and Peace, I’d be slaughtered by the drug taking liberal elite. OMG it’s so like totally I mean like whatever….LET’S BLAME BUSH for all this. Didn’t he like ignore Kyoto or something? I don’t see why quakes can’t be the result of Catastrophic Man-Made Global Warming. Everything else is. And if not that then America or the Jews. God, being a lefty is so trouble-free. I’d love to read an explanation from any one of those Twittering pinheads how climate can possibly have any impact on the shifting of the earth’s tectonic plates. The ignorance is stupefying. Worse – they advertise their ignorance on the net. You have to admire the stupifying ignoracne of the “Alexporter82” who enjoys NASCAR and then whines about global warming. I see he’s into Yoda, Uri Geller and Buddhism. New Age toss – stand-in for Cash Peters on Up All Night perhaps. I always thought they had Twitter’s two syllables the wrong way round. Suspicion confirmed. The inexorable wheels of the evolutionary process must be very close to one of those points in time which paleobiologists call “mass extinctions”. It surprises me that these people have enough intelligence to remember to get up in the morning. Without considerable support from the rest of us, they would surely breed out. serving only to amuse us through the record of their passing in the “Darwin Awards”. Who lets them breed ? I think you will find the nurse wakes them up. I love the last one. So either Britain had secret knowledge of the Chilean earthquake before it took place, or we actually caused it by drilling in “Las Malvinas”. The former of course is the holy grail of earthquake science. If we were able to forecast earthquakes to within a small enough time period, almost all loss of life could be avoided. As it is, we can only predict there is X chance of an earthquake of Y magnitude in the next Z years, which is only useful in terms of building and civil engineering planning. An interesting fact is how well the Chileans have coped; this was a massive earthquake but the loss of life has been comparatively small. Actually most loss of life can be avoided if third world countries enforced proper building codes. Look at the rat hole nations where the buildings fall done, Chile, Haiti, China, Iran. Notice a theme? It’s VERY easy to design buildings that don’t fall over if given a shake. Sorry, but Chile is not as you characterise it, Martin. It’s pro-west, capitalist, and very well organised indeed, especially with regard to building codes. Its engineers and architects are well up to speed on seismic design. I worked in neighbouring Peru on a construction project and had to visit Chile for a meeting. I was hugely impressed with the standards of living in Santiago compared to Lima. I was told by a local official that this was due to the ethnic make up of the population. Peru was 80% indigenous Indian and 20% European. Chile was the reverse. Make of that what you will, but at risk of inviting the “r” word, I’ll say that the standards in Chile were way ahead of Peru. These are just the “educated” people that the Labour party rely on. The ignorance is astonishing. I often wonder if McBrown has been donating sperm for many years. So much for Blair’s education, educayshun, edgyka…wo’evva! Only link I can find for now is second hand for BBC confusing natural disasters [such as earthquakes] with climate change. Of course, this is old news to Guardian readers, and we know the views of the Guardian and BBC are entwined. This reminds of those people who made a sacrificial offering to their god, for if they didnt, they knew that their god would very very angry, and bring about a calamity. Only this time, for some nameless reason or other, they are not sacrificing virgins. Their vengeful god is quite happy this time, to accept financial contributions (Not Tax exempt though). Reading some of the comments about the link between earthquakes, tsunamis and AGW, I could not make up my mind if these people were serious, or simply the dupes of global propaganda. If the latter, then I have sympathy for them. It is not their fault. One thing for which is there is no doubt. The link between AGW hysteria and insanity, is now an established fact. The science is peer reviewed, all psychiatrists are in common concensus, and there is no further need for debate. The evidence is in the links above. This is the conclusion of highly qualified people with years of training and experience. You have a right to your opinion, but it does not make it equally valid. Sure, except the only thing they seem to be sure of so far is that earthquakes might be triggered by drops in sea levels, not rises, i.e. the kind we’re all supposed to fear due to Man-Made Catastrophic Climate Change. The rest is supposition and extrapolation. I read that link. The words “may” and “could” litter the piece. There is not one solid item of proof.It’s all conjecture. Of course, we know exactly from which stable the scientists there come from, don’t we? Expect more of the same spin.After all “the team is confident…”. I bet they are – knowing that the global MMGW gravy train is on their side. Oh – and correlation is not the same as causation. Thanks for the science lesson JohnW but I’m sure they know that. This is scientific theory, not your mate Dave’s theory. The operative word is THEORY! 1. a coherent group of general propositions used as principles of explanation for a class of phenomena: Einstein’s theory of relativity. You seem to be using definition 2. Scientific theory is more about definition 1. Scientific theory aside, as JohnW says, what these gentlemen have is a hypothesis. A hypothesis based on their scientific observations (and years of experience). It might be right, it might be wrong. It will be tested. You are doing them a disservice to suggest it is baseless opinion, it deserves more respect than that. I think the propwr word to use here should be “hypothesis” rather than dignifying it with the label of scientific theory. At best they summarise a number of educated guesses. They seem to work backwards – i.e. knowing what the answer is and then fitting their observations into a loose collective of ideas that tend to supprt the end result. This is not what I would call rigorous, peer-reviewed science! Unfortunately, unless you have a PhD in a relevant area, I don’t have to take your opinion seriously. Head of the IPCC R K Pachauri has his PhD in Mechanical Engineering after working at the Diesel Locomotive Works in Varanasi – which is hardly a “relevant area“. So are you confirming that we don’t have to take him seriously? OK, I’ll let you concentrate on how to ‘nail me’ on some inconsequential point. I will direct my efforts towards a more constructive conversation. An inconsequential point? It was the one and only sentence of your comment. Or are you saying that your comment was inconsequential?